Another day; another board. I’ve finally submitted the first module of my Degree course (Harvard Referencing and I have established a very dysfunctional friendship, but we’re working on it). 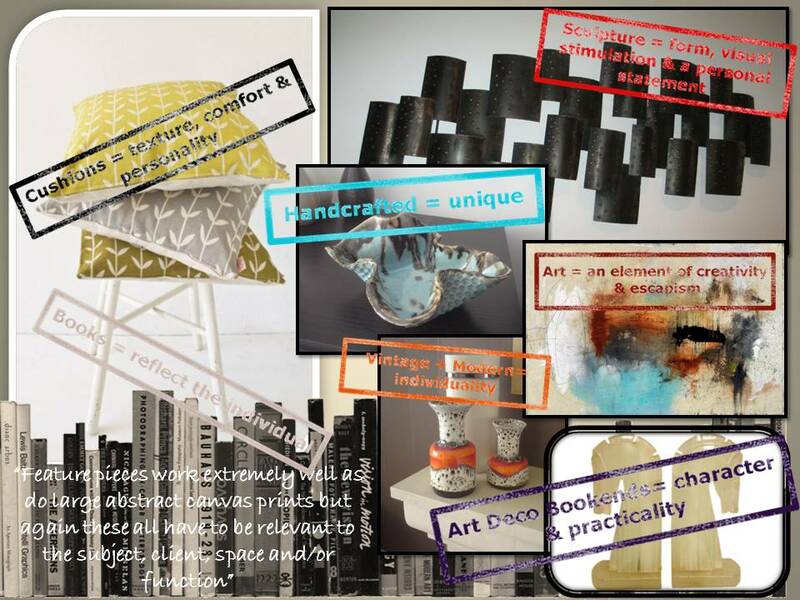 I was required to illustrate ‘objects’ – we all know that including objects within a design scheme can personalise a space; underpin a design theme; pick out accent colours, and provide much needed visual stimulation, texture and depth. A scheme that only includes mass produced items and particularly accessories that are all from the same genre/period will create a space that is lacking in character and personality. Consider mixing and matching vintage pieces with contemporary; or including unique, hand-crafted items that spell out how creative, imaginative and individual you are! Stand out from the crowd and be proud! Can you believe that the above Jasba vases were hiding in a cupboard at my mum’s house before I rescued them? They are vintage; original and completely unique (never mind collectable!!) and should be allowed to shine. The accent colour in the above space was orange and these little vintage gems complimented the colour scheme to perfection. 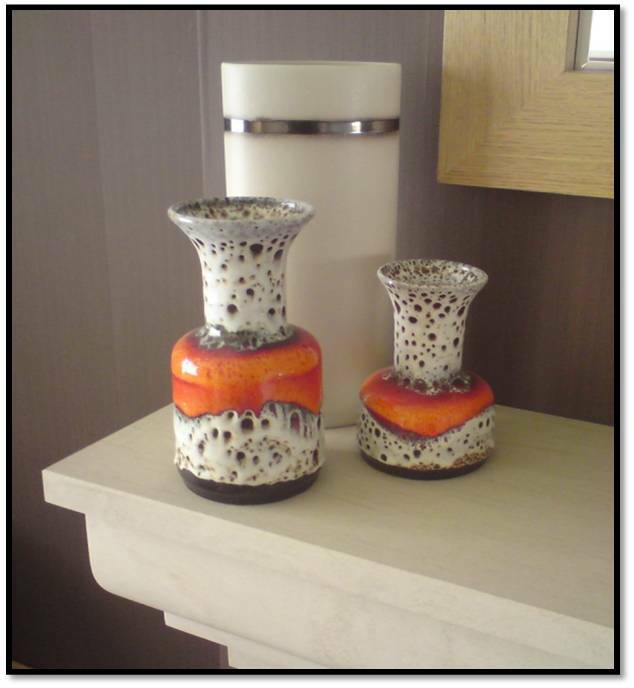 To add a little height and provide contrast I positioned a contemporary Jasper Conran vase behind them – its minimal aesthetic with metallic detailing adds to the overall visual display. 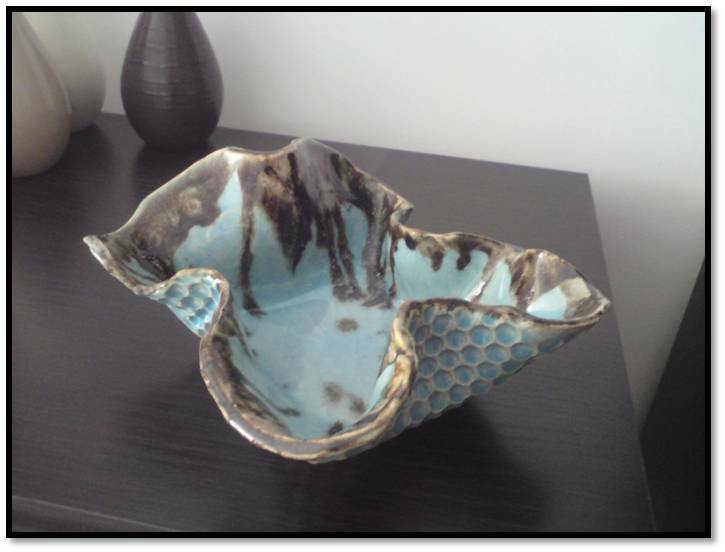 The pictured bowl is handmade and takes pride of place in my bedroom. It picks out the accent colour of powder blue used elsewhere in the space and adds visual stimulation because of its use of form and texture. AND its unique!! I highly recommend that anyone feeling inspired by this post goes and has a rummage in a few those boxes hidden in the attic – you never know what vintage delights are desperately waiting to be rescued!